At Sky Express, the lone Chinese food stall at the predominately Japanese Mitsuwa Marketplace, stick with the simple and starchy. No matter how tempting the plastic dim sum mockups appear to look, you’re better off saving your cravings until you can get to Arcadia for Din Tai Fung or the San Gabriel Valley in general. They simply don’t have enough turnover on the dim sum to make it the way it should be made. What you want here is whatever’s on special, a bowl of noodle soup, or anything that comes with rice. 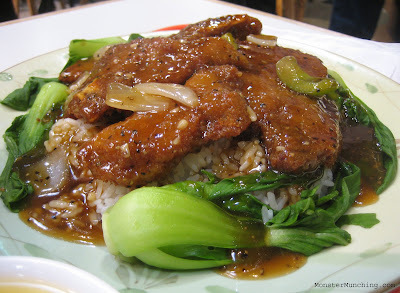 For dinner one night, I took the dish you see above: fried swoops of battered pork chop, smothered in a cornstarch-thickened black bean sauce, the whole thing dumped over a mound of steamed white rice and framed by ring of baby bok choy—a work-a-day meal that works. On the plate is everything that fits in my definition of comfort food: it starts with rice and involves something pork, something gravy and something green. What I loved about it is how positively homey it was, how accessible it would be to all palates; but at the same time, slightly funky thanks to the presence of fermented black beans. I never want to eat at Sky Express, but that plate in the pic looks so good. Thank you for being a guinea pig (pun not intended) and sharing this tip! It's kind of hard to go for Chinese when walk into Mitsuwa. At least there is options but there dim sum looks sad. I guess it is best to get something cooked fresh. I've never tried their dim sum, but I've found their Hong Kong style chicken chow mein and beef chow fun to be quite tasty and authentic when I don't have the time to drive over to Sam Woo or SW Seafood in Irvine. It's pretty counter-intuitive to go to Mitsuwa and not have ramen, curry, or donburi, but if you're going to deviate, this is the dish to get! Simple and relative cheap for the amount of food! Interesting! I never even thought of the meaning behind the name. Just thought it was something random. Agreed. Avoid the dim sum. Danger! Will Robinson! Danger! Ah, beef chow fun! That's what's I'm eatin' next! This place reminds me of the food court eateries in Hong Kong and Singapore. Now if only we can get some decent laksa! Looks like a good amount of food for a quick lunch. I wouldn't be able to resist going into the store and buying some Japanese candy as dessert. I have to try Sky Express sometime soom! Their beef and egg rice dish looks very good (I see this dish at a table whenever I go to Mitsuwa) but this sounds great.